Between planning a bachelorette party, providing emotional support, making sure everything runs smoothly and catching a flight, a bridesmaid's duties can feel endless. It's no wonder that, with everything running through her mind, this one bridesmaid forgot the most important item she needed to bring for her friend's destination wedding in Costa Rica: her ceremony dress. What ensued was a series of tweets that eventually reunited bridesmaid with dress and saved the day. After realizing that she'd left the gown back home in Houston, Texas, the bridesmaid's friend, Taylor Kenney tweeted Southwest Airlines, who the bridesmaid flew with, asking if it could send the dress on the next flight to Costa Rica. "help!!" she wrote, "My friend is in a wedding on Saturday in Costa Rica but she left her bridesmaid dress here in Houston. Can we get her dress on flight #1734 tomorrow? #WorthATry #BestCustomerService." To her surprise, WN said yes to the dress and replied that it was going to step in and help. 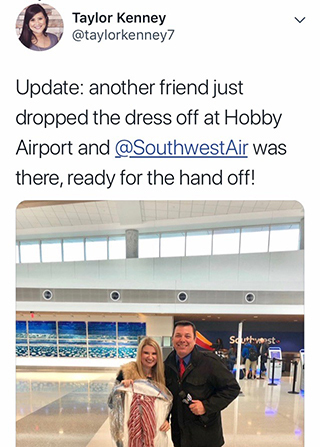 A few hours later, Kenney shared an update of another friend, Rachel, dropping off the bridesmaid dress where a member of the airline's staff was ready to collect the item. The Twitter exchange has since gone viral, with social media users praising the A+ friends, and airline for its customer service. One commenter described the gesture as "an above and beyond thing" that would "touch the hearts of many." Others took it a step further, asking to see photographs from the wedding given the atypical striped bridesmaid dress. Finally, after the conflict with its airline mechanics dominating media stories, a dress gives Southwest some positive press.